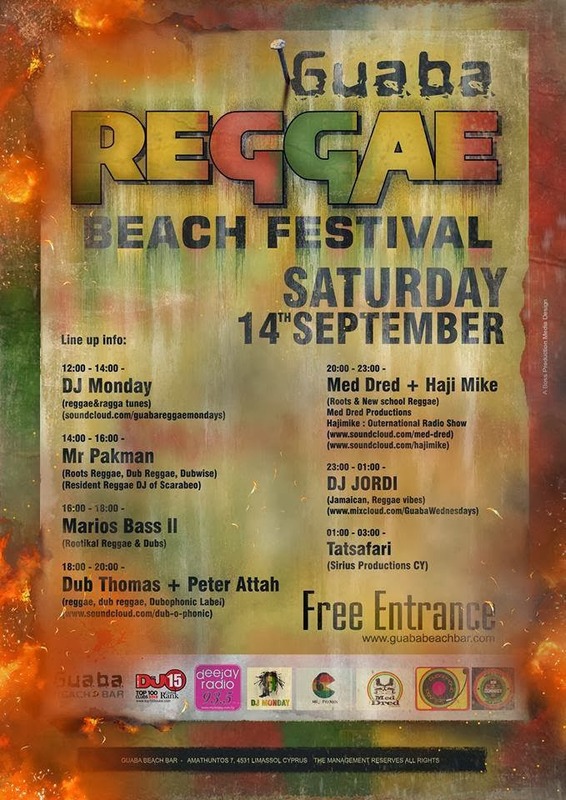 This weekend we had a chance to present many of our tracks, as well as a selection of unreleased tracks, during the 1st Guaba Reggae Beach Festival in Limassol, Cyprus. 15 hours of Reggae music from local reggae DJs and producers from all over island, playing the best in in reggae, ragga, roots, dubwise and steppers! It was one of the best venues we ever attended, directly at the beach facing the marvelous Mediterranean sea directly in front of the sound booth. The party started at 12:00 and ended at 03.00 of the next day. Representing Dubophonic were toaster/mc Peter Attah, Med Dred on the live melodica and selecta Dub Thomas dubbing it all together. Respect to all Dubophonic artists for sending us their work. Unfortunately we couldn't play all of your music due to the time limit we had, nevertheless we tried to play a decent selection of released & unreleased tracks from Negritage, Zion Dirty Sound, Mexican Stepper, Ras Robin Dennis, Jennifer Paulos, Sunjaman & Red Star Martyrs. Check out the podcast and enjoy the vibes!